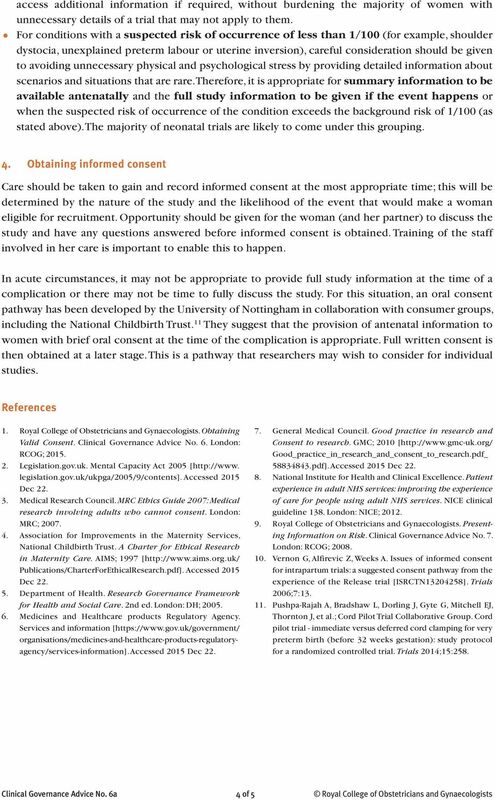 Download "Obtaining Valid Consent to Participate in Perinatal Research Where Consent is Time Critical"
Birth after previous caesarean. What are my choices for birth after a caesarean delivery? Monitoring your baby during labour. HIV in pregnancy: information for you Published February 2005 by the RCOG Due to be reviewed in 2007 Contents Page number Key points 2 About this information 3 About HIV 4 What could it mean for my baby? How will I have my baby? 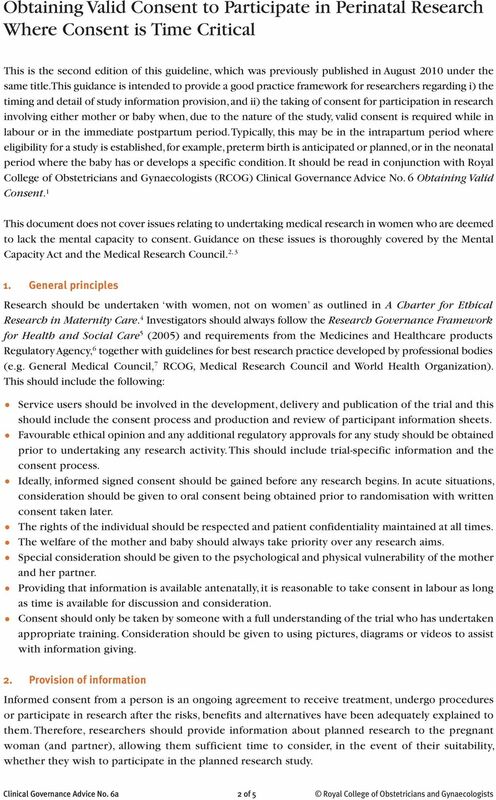 Guideline for the management of reduced fetal movements after 24 weeks gestation. Claiming Compensation for Birth Injuries. 7. Third stage of labour 7.1. Duration of the third stage of labour What is the duration of the third stage of labour? The third stage of labour is that which occurs between birth and placental expulsion. Information for you. Chickenpox and pregnancy. About this information. What is chickenpox? What are the symptoms of chickenpox? Information for you Published in June 2015 (next review date: 2018) Chickenpox and pregnancy About this information This information is for you if you want to know more about chickenpox and pregnancy. Information for you Published in August 2010 (next review date: 2014) An ectopic pregnancy What is an ectopic pregnancy? An ectopic pregnancy is when a pregnancy starts to grow outside the uterus (womb). 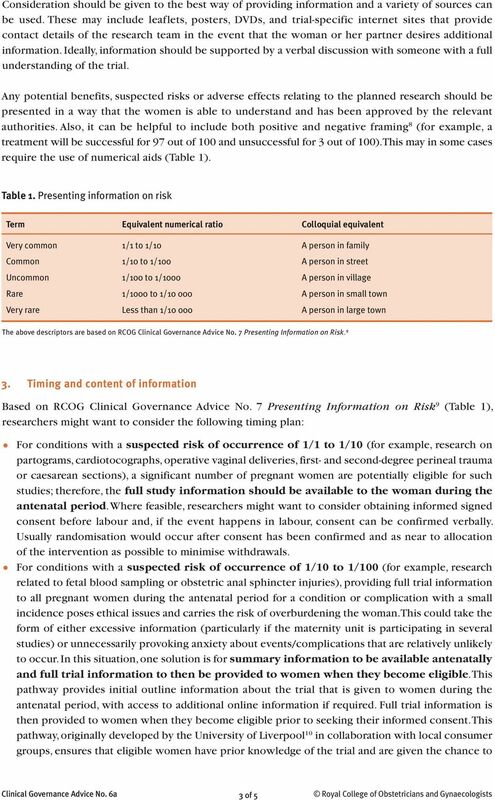 Trust Guideline for the use of the Modified Early Obstetric Warning Score (MEOWS) in detecting the seriously ill and deteriorating woman. This leaflet sets out the range of maternity services available for women and their families across Barnet, Enfield and Haringey. Testing for gestational diabetes A Parent Information Leaflet What is gestational diabetes? Diabetes is a condition which means people have higher levels of sugar (glucose) in their blood than normal. Who Is Involved in Your Care? Ethics and Patient Rights (EPR) Standard EPR.1 [Verification of credentials of professional staff] The organization has an effective process for gathering, verifying, and evaluating the credentials (e.g. A Guide to Clinical Trials For young people with cancer and their parents Children s Cancer and Leukaemia Group www.cclg.org.uk Original booklet produced in conjunction with the CCLG Patient Advocacy Committee.